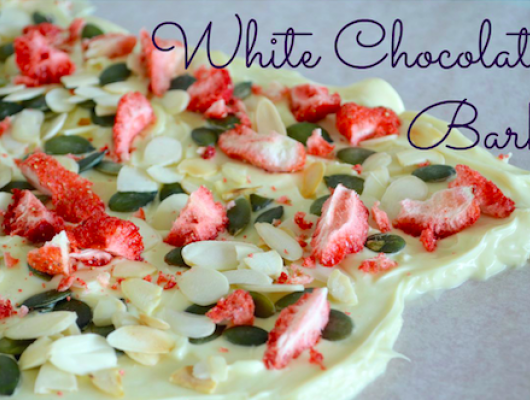 Place the white chocolate chips into a mixing bowl to be melt in a double-boiler. Stir occasionally and make sure all the chunks are melted. Do not allow the water to touch the bottom of the mixing bowl. Roughly slice the freeze-dried strawberries if they aren’t already. Toast the shaved almonds over low heat in a non-stick pan and stir occasionally. until you see specs of golden-brown. Keep a careful eye on it as they can burn easily. Prepare a baking pan lined with cooking paper. 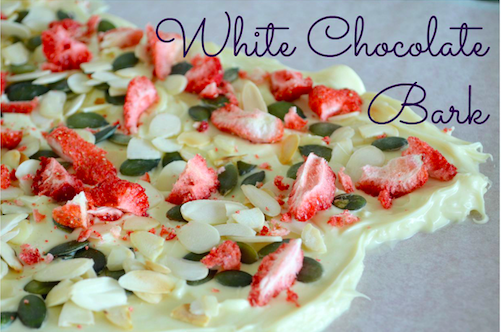 I used a large pan and roughly spread the white chocolate over with a spatula. You can use a smaller size dish and spread the chocolate up to the edges if you prefer a perfect shape. Then sprinkle with the strawberries, almonds and pumpkin seeds. Place flat in the fridge for at least 30 mins. Slice with a sharp knife when ready to serve. Make sure to place onto a cooking sheet before placing onto a dish for presentation, otherwise it will melt and stick to the plate. With just a few basic kitchen ingredients and stock items, you can create a very simple and easy sweet ending to a meal with friends. This was my very first time making chocolate bark and I upgraded it with just a few items I found in my mom’s kitchen. Freeze-dried strawberries are a pricey snack but it’s worth incorporating into a creative dessert like this one! Other ideas: strawberry Pocky sticks, freeze-dried strawberry powder on vanilla ice-cream…what else?